An interview with the inspirational Ana Carneiro, editor of One Aware magazine on setting up the publication, what mindfulness means to her and how it could be the key to sustainable living. One Aware is a bi-annual print magazine that explores what it is to live mindfully today; it explores our journeys towards a more mindful and sustainable future through thought provoking imagery and editorials. Ah, my most dreaded question! I’m a Portuguese girl in London, who loves to ask questions but feels lukewarm about giving away any personal information in a public manner. I’m still struggling with the whole ‘putting myself forward’ as an example of my brand’s values. I’m an introvert, a bookworm, a woman who is passionate about living an incredible life but not at the expense of the planet. I’m not as serious about leaving the smallest environmental impact as others, but I try my best. I studied Product Design at Central Saint Martins, but I don’t define myself as a product designer - though I think like one, and may on occasion get very judgmental of stuff I see on the market. I love Art in all its forms, and I love curation. I think of curation as a form of creative expression and in my free time I love curating selections of products, photos, essays, music - even foods that look and taste good together. Also, I’m a dog person. What was the inspiration for One Aware? There wasn’t one particular thing that inspired me to start this magazine. Sure, there are publications I love and admire, but One Aware doesn’t necessarily take inspiration from them. I realised that I wanted to explore what living mindfully looked like beyond the use of sustainable and ethical products, and the written medium was best suited for this exploration. In a way, I was scratching my own itch: I wanted to know what living mindfully meant for other people, but I wasn’t interested in writing a research paper on the subject. The other kind of publication where multiple people contribute their experience and write towards one common goal is the periodical, most commonly in the form of magazines. I personally love print, and so once the idea of a magazine was in my mind I knew I wanted it to be physical, not digital. Print invites people to slow down, and a part of that is because we step away from screens. Print nudges us into a different kind of interaction: the experience of opening a book or magazine for the first time, feeling the grain of the paper, noticing the soft curves created by the binding. Images on print ask to be contemplated and make one dream while softly gazing elsewhere. Text can be seen in its entirety at a glance, communicating its length and therefore the importance of the subject. The reader can go back and forth at a leisurely pace until an idea or opinion has been fully weighed and understood. Maybe these are romantic ideas, maybe doing a print publication sounds slightly indulgent, and I’m fine with that! For the feel of the publication, I was inspired by my routine of journaling. I regularly put my thoughts, ideas and feelings on paper. It helps me make sense of the world and figure out where I’m headed, to gain a sense of space and freedom. I imagined a place welcoming to all, a place where thoughts can wander and questions are free to come and go, where eyes can rest on one place without a dozen other things demanding their attention. What does it mean to you to live mindfully in today’s world? I actually think that living mindfully looks more or less the same at any given time, and I don’t believe that the way of thinking is unique to today. It is our struggles that change according to the times we live in, and I think it’s fair to say that we face more distractions today than ever before. Today we face an unprecedented number of challenges to remaining present and focused: we are surrounded by things designed to capture and hold our attention - from advertisement everywhere to social media notifications and distracting apps in the gadgets we once saw as work tools. The many ways of ‘staying in touch’ available to us have made it so easy to do so that we feel guilty about not immediately replying to that email or to the Whatsapp message from the friend we haven’t seen in a few months. We’re also spoilt for choice, and will spend hours each year simply trying to decide on what film to watch that night, what to cook for dinner, what are the best weekend plans, etc. #FOMO has people making themselves busy with a hundred different things which they don’t fully enjoy, because they are rushing through those experiences or already thinking of what they’ll do next. When thinking of what it means to live mindfully, the first and most important thing for me is to stay present. I can’t claim to have successfully mastered all aspects of being present, but I have gained much happiness in the last couple of years by acknowledging the value of each moment and pushing competing thoughts away. 1. What contributes the most to my happiness? 2. What is most aligned with my values? 3. What will have the greatest positive impact on my life and the lives of others? If you aren’t sure of what your values are, I cannot recommend enough that you take the time to do some soul searching this new year, and write those down. My life changed quite a bit after I was clear on my values and my priorities - before I would find myself feeling down when doing something I thought I enjoyed, only to later find out that I might once have enjoyed it but it was no longer aligned with my values. It also eliminates a lot of alternatives from my questions of what to eat, what to buy, what plans to make, which leaves me the mental space to focus on what makes me happy. The third thing is to be aware. Practicing awareness isn’t just about being in the moment or even as simple as reading labels. There is far too much green-washing in today’s world and very often I think I there is need to do some background research on where things are really coming from, and if they are truly as aligned with my values as they appear to be. This is perhaps the hardest part of being mindful, as it is mindfulness applied to the world at large, and research often leaves me feeling unsure or disappointed. But once again, it takes many options from the table and leaves me clearer on what adds values to my life and to the world. Why do you believe mindfulness is the key to a sustainable lifestyle? Living mindfully is essentially going through life paying intentional awareness to our place in the world. I think it’s easy for anyone who dwells on the question to agree that the world wasn’t created for the sole enjoyment of a few generations of the human race. When we go through life being aware of how we relate to the people around us, to what is around us, and to the world at large, we cannot help but being aware of our impact in the world. And often enough our impact is extremely negative - but with this awareness comes also the understanding that we can change what impact we have. I believe that mindfulness is at the core of a lot of the positive changes we want to enact. It is key for aligning our lives with our values of sustainability because it keeps us connected to the world, and makes it impossible to ignore what kind of impact we are having. The internal conversation changes from ‘I should do this, because it is the sustainable thing to do’ to ‘I want to do this, because I am part of this world’. If you could give one piece of advice to those looking to follow a more conscious path, what would it be? To ask questions. If I question your habits, you’ll probably get a bit defensive and then go on to do the same things you always do - routine is reassuring. But if you question yourself, you’ll eventually reach a point in which you’re tired of questions that lead to nauseating answers and start changing your way of thinking, of acting and, therefore, of being in the world. I think the most powerful agent of change is a good question asked at the right time. Thank you Ana, for taking the time to speak to Flor + Cesta, your drive and ethos is an inspiration. We have taken some big learnings from speaking with you and we cannot wait to follow the One Aware journey. 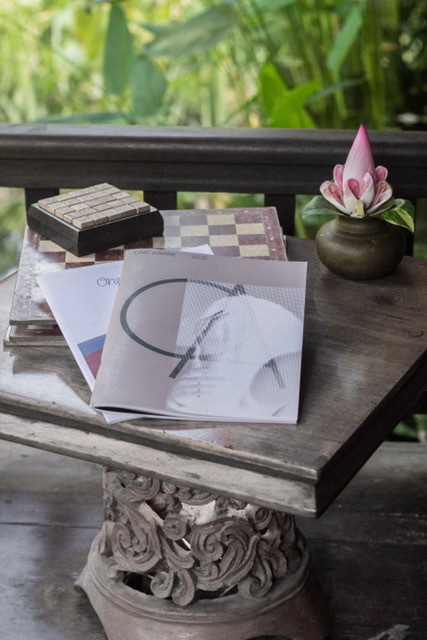 Until the end of February Ana is offering Flor + Cesta readers the chance to get their hands on a copy of the first edition of One Aware for just £9.50 (retail price £12), just enter the code OneAwareFlor at the till.